YouTube is a sensation among millennials, and Hyderabad is definitely on the online entertainment map with these hilarious, fun, and creative Youtubers who have built a following not just in the city, but all over the country. So, browse through their channels if you haven’t already and get ready for some LOLs, tips, and pure enjoyment. With over 1,21,728 subscribers, Kantri Guyz consists of four Hyderabadis who cover everything from spoofs and comedy to sketches and pranks. With over a million views on their channel, some of their most popular videos include Hyderabadi Moms Everywhere, and their more recent Typical Exam Invigilators. Their videos are relatable and the humour will make any local laugh. Plus, non-locals can get a scoop or two on Hyderabadi quirks. Give you a glimpse into the life of a middle-class Telugu girl is what Mahathalli aims to do. And, Jahnavi Dasetty does it brilliantly with her fine acting and detailed writing. Be it preparing for a government job or revisiting your student life, her content deals with everyday situations that are humorous and can be shared with family, friends, and bae too. She has over 6,17,781 subscribers and if light Telugu entertainment is your thing, you should totally check her channel out. With over 6,17,781 subscribers, her channel keeps growing everyday. You can add to it too! The tech master, Ranjit has made geeky the new cool with his channel Geekyranjit. He shares his views on the latest mobile phones, makes comparisons in the features and technicalities of different electronic gadgets as well as gives you tips on some of the best tech products to invest in. He has answered FAQs about One Plus 6 after only using it for eight days. His viewers swear by his recommendations and base their decisions on it, so much so that he is the top tech based Youtuber in the country today with over 1,744,394 subscribers. So if you ever face a dilemma about what phone to buy, you know where to seek answers. Priyanka Boppana focuses on fashion and shopping by covering hauls, look books, and taking up shopping challenges too. She is amongst the few fashion vloggers in the city whose content will solve all your beauty and fashion woes. Look at her video of Kurti and Maxi Dress Haul here where she shares details about the material, price and comfort levels of each outfit, therefore sharing great fashion tips, and you can also get some pointers from the lady on how to style your accessories. Her channel is comparatively new, but hail fashion, beauty and lifestyle vlogging on YouTube as she’s quickly growing with over 19,241 subscribers already. 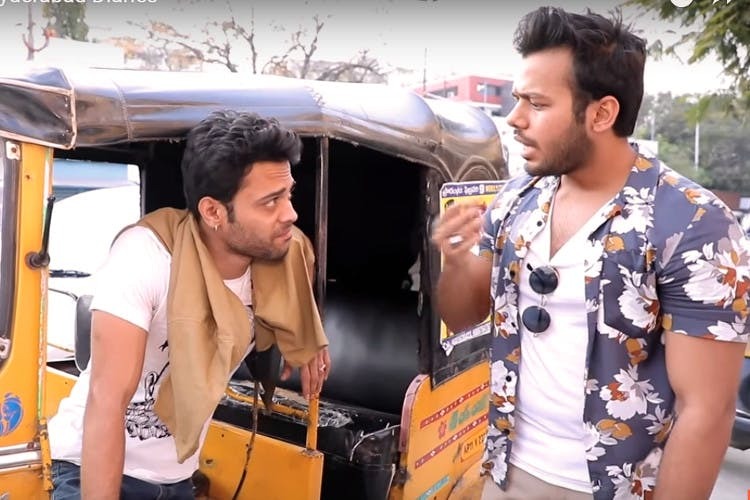 A channel started by two local boys, Shahrukh Khan and Abrar Khan that promotes Hyderabadi culture and lifestyle with its funny depictions and usage of Dakhani language, has become a major hit among youngsters in the city. If it ever happens that you’ve moved to a different city and start to feel homesick and miss everything about Hyderabad, just watch any of their videos and get rid of the feeling. We do that every time we miss the ‘hau‘ and ‘nakko‘. They cover short comedy skits, random facts, popular songs in Hyderabadi language and vlogs too. Watch their comparison of a normal person and a Hyderabadi, or a video showing similar situations when siblings of opposite genders face them. They have been representing Hyderabad at YouTube fan fests and entertaining their 3,32,425 subscribers with new content every week.